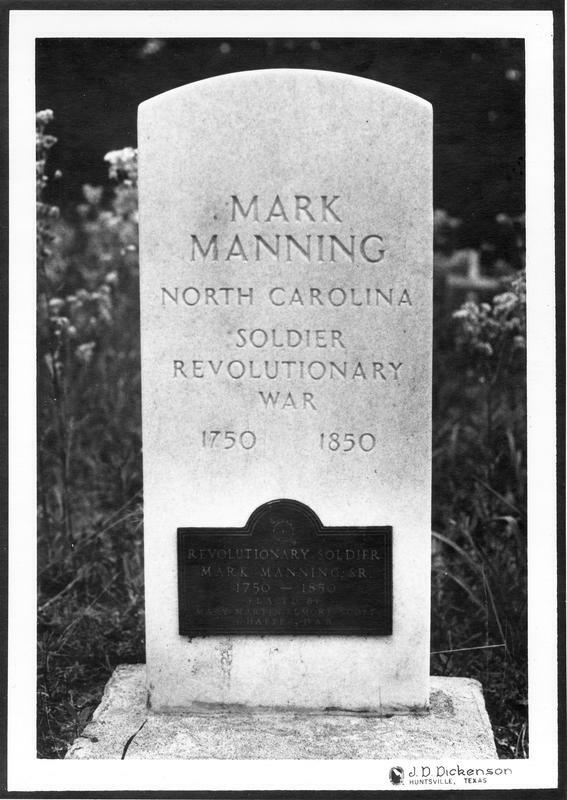 Mark Manning served in the American Revolution from the Halifax District of North Carolina, his native state. He later lived in South Carolina and in Conecuh County, Alabama, and came to Texas at the age of 97 to live with his sons, who had large land grants and helped to settle Walker County. Some 20 or 30 veterans of the American Revolution followed the nation's westward movement to Texas, perpetuating here their devotion to freedom and liberty. Manning's sons fought in the Texas Revolution before he came to the New Republic. Manning is buried in a family cemetery (2 mi. NE). On IH 45 northbound access road at Brimberry Cemetery Road north of Walker County northbound rest area. 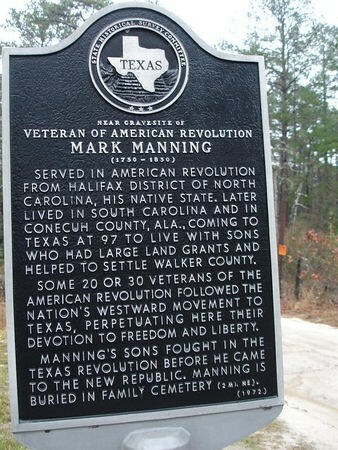 Texas Historical Marker, “Mark Manning,” East Texas History, accessed April 21, 2019, https://easttexashistory.org/items/show/177.